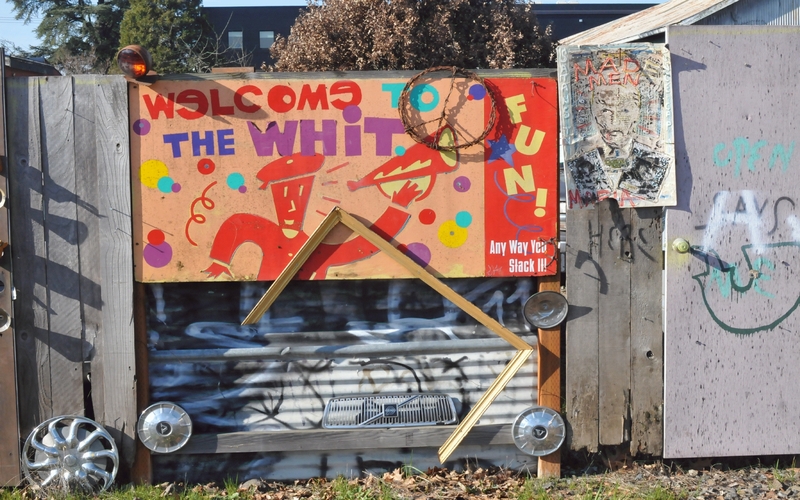 A brightly colored sign read, "Welcome to the Whit, Fun! Any way you Stack it!" And next to the sign a man's face, labeled, "Mad Men." A blue spray painted board highlighted this section of the wall. 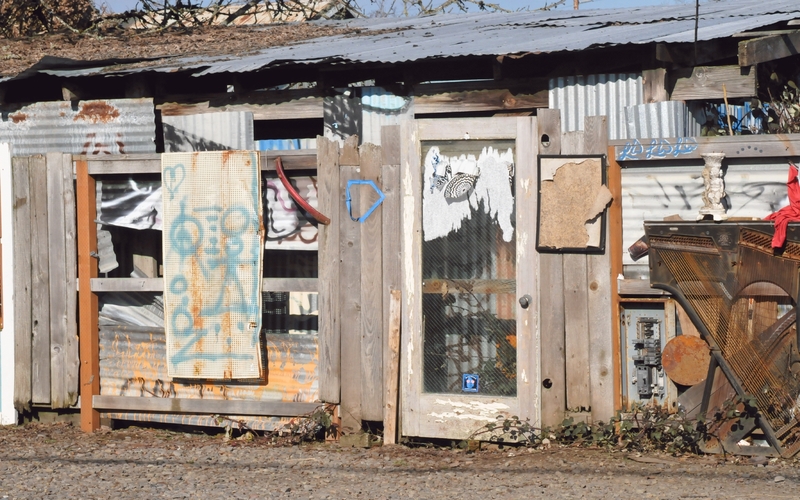 Here, whatever was behind the wall was covered with a tin roof. 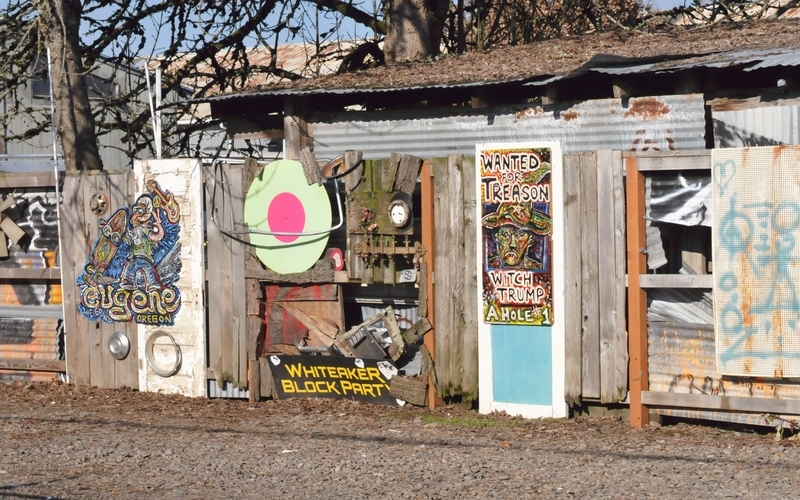 Further left on the wall were words, "Eugene," "Whiteaker Block Party," and "Wanted for Treason, Witch Trump, A Hole 1." Small portraits of animals on pieces of tin decorated a section of spray painted wall. To the right of the animals was a partly visible sign that read, "All Gave Something, Trump Gave Nothing." 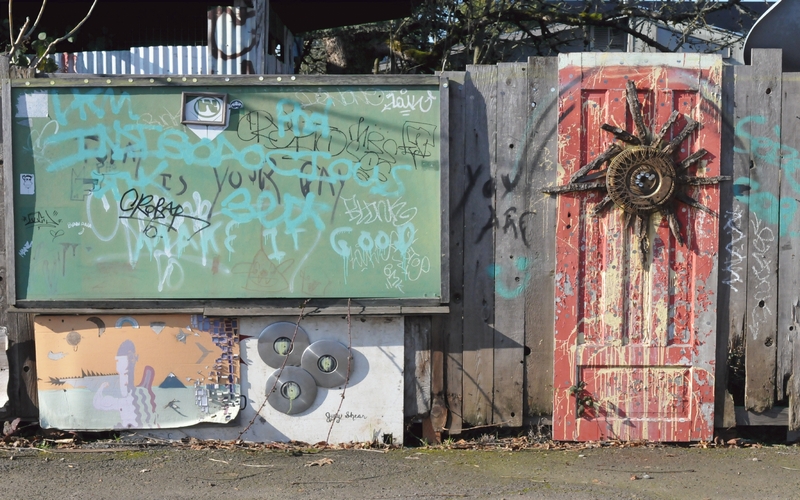 A crudely made star decorated a faded red door. Next to the door, a green panel was covered in graffiti. 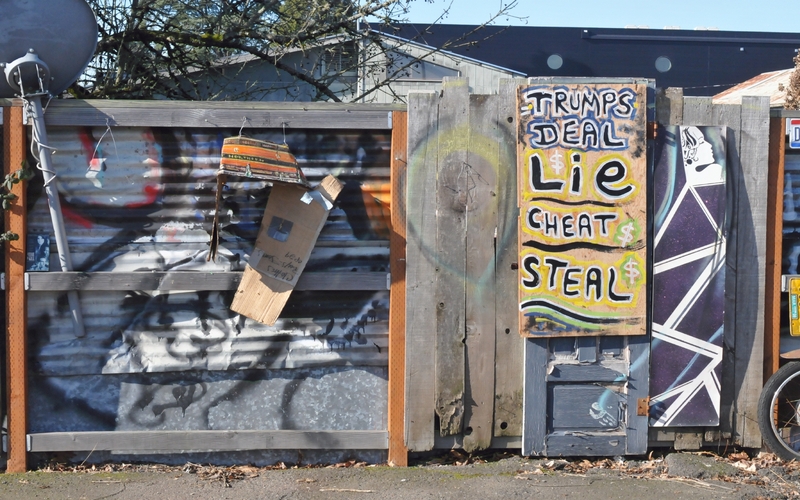 A sign that read, "Trumps Deal, Lie Cheat Steal," had been applied to a narrow door. 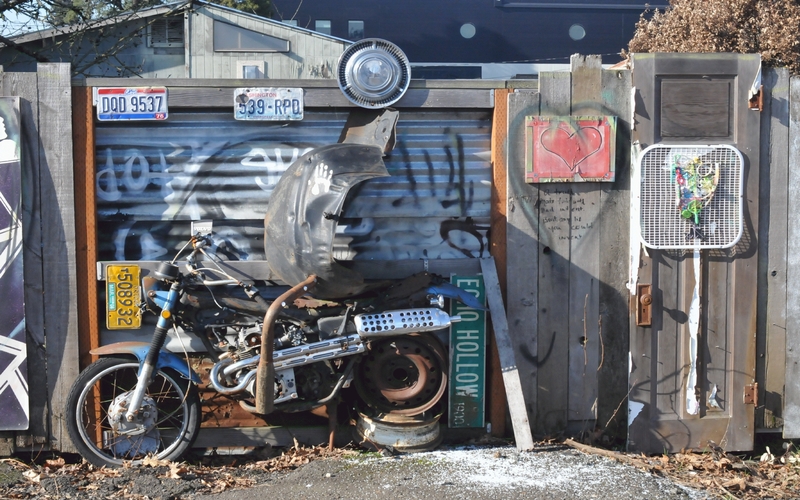 A motorcycle was parked and over time became an element in an art wall. In addition to license plates, an end-wise street sign read, "Echo Hollow." An empty frame enclosed the words, "Life Is." Below that was an old Z sign. Cars parked in the parking lot were reflected in the glass panes of a weathered white door. 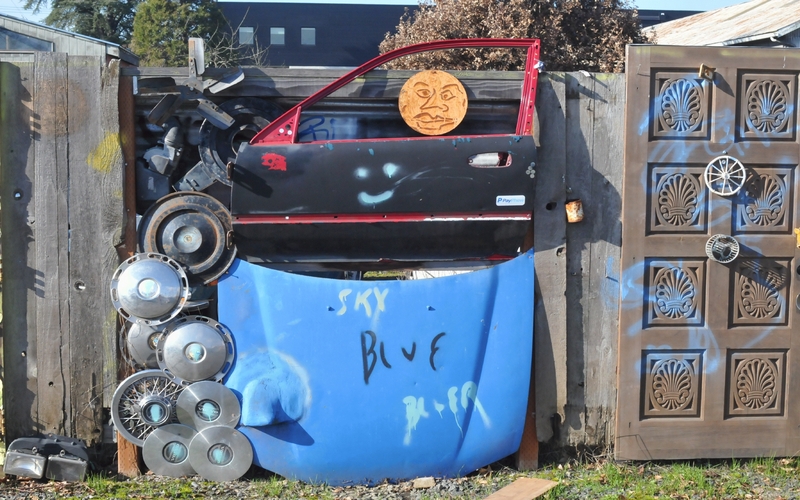 A sun face drawn on a round piece of orange wood, was attached above a blue face spray painted on an automobile's door. Words on the car's hood read, "Sky blue." 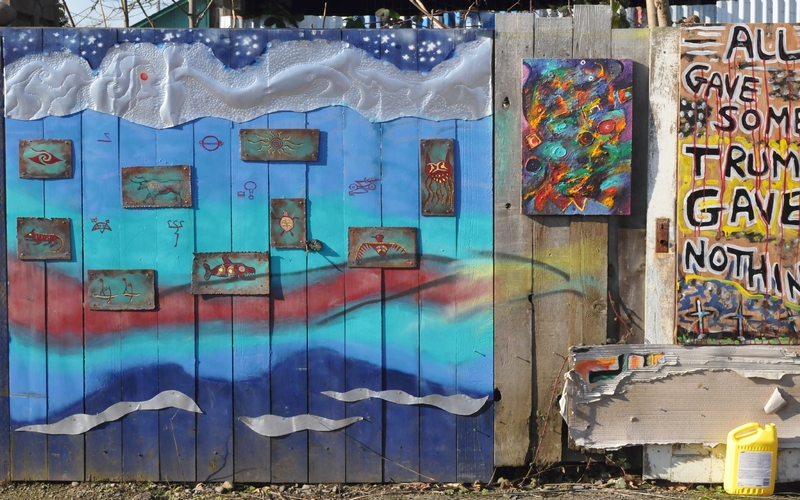 To the right, blue spray paint decorated a brown door. A wall was constructed to separate the parking lot from whatever was behind the wall. 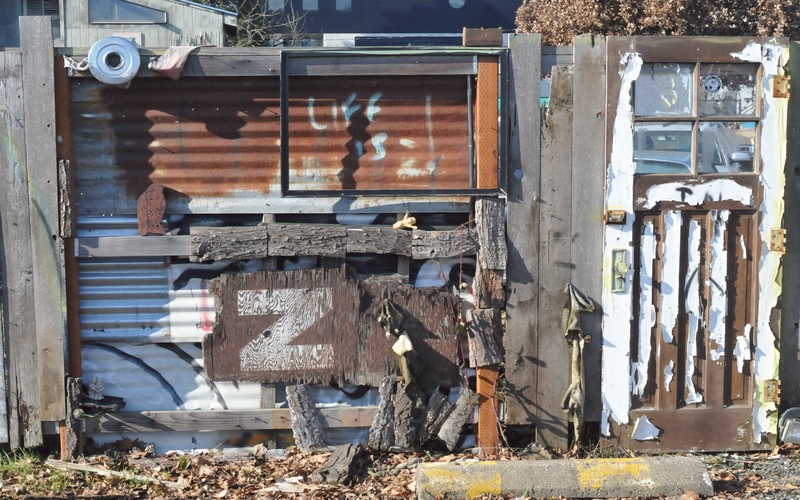 From a distance, the wall appeared to be made of scraps, but up close it was clearly a series of works of art. 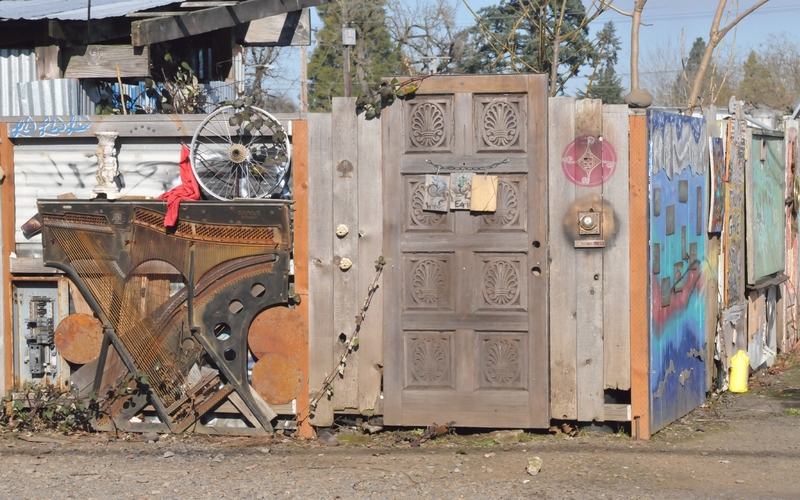 The door here, for example, was non functional, but when placed next to a piano's metal guts, formed a pleasing esthetic. 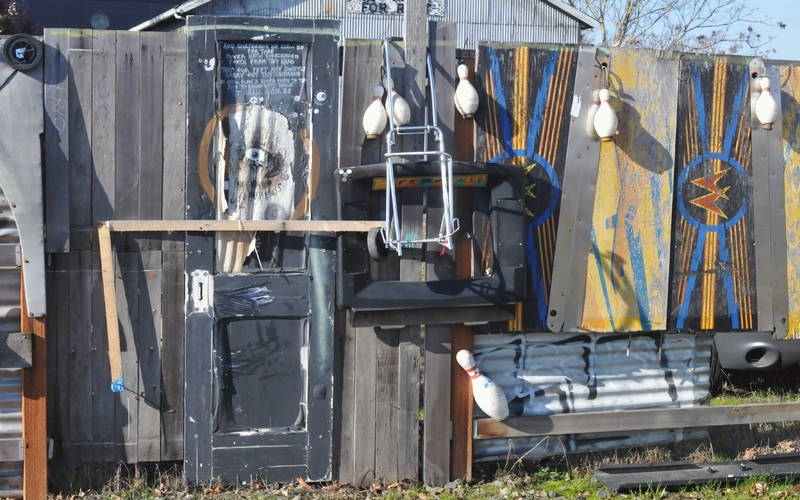 A painted eye that gazed out at parked cars was counterpointed by bowling pins. 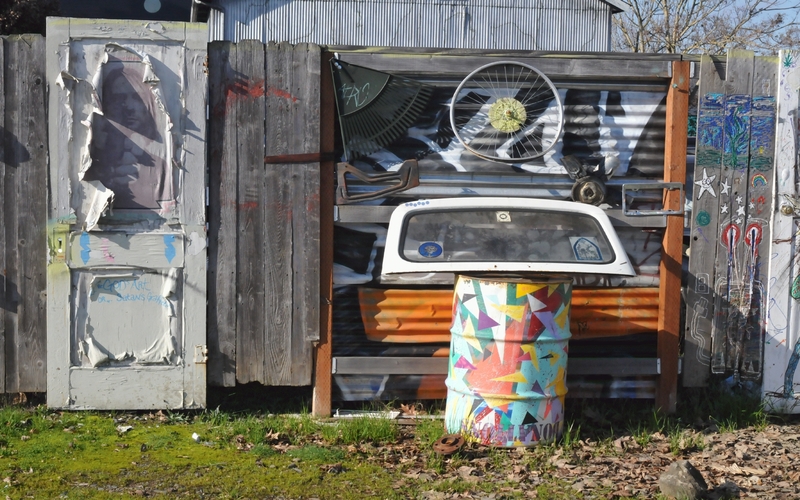 A painted metal drum supported the windshield of a compact car. Above which was a bicycle wheel without a tire. 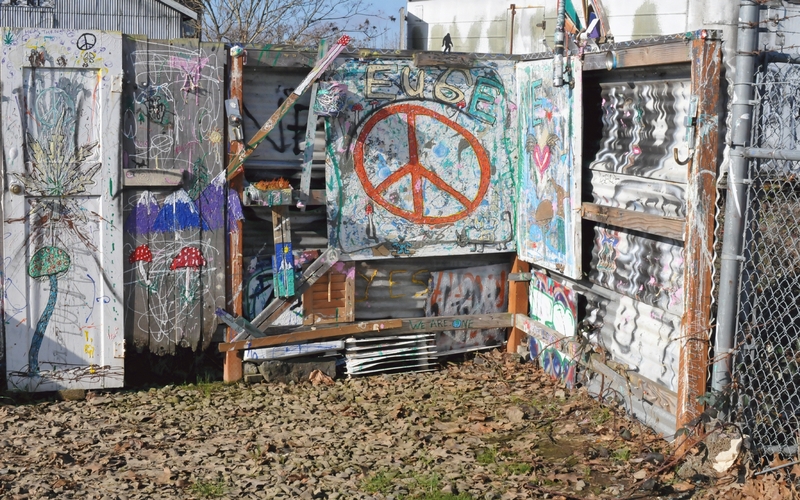 The decorated wall ended at a corner which highlighted a peace symbol under the word, "Eugene." To the right you can see how the art fence gave way to an industrial chain link fence. It was on this chain link fence that portraits were hung.